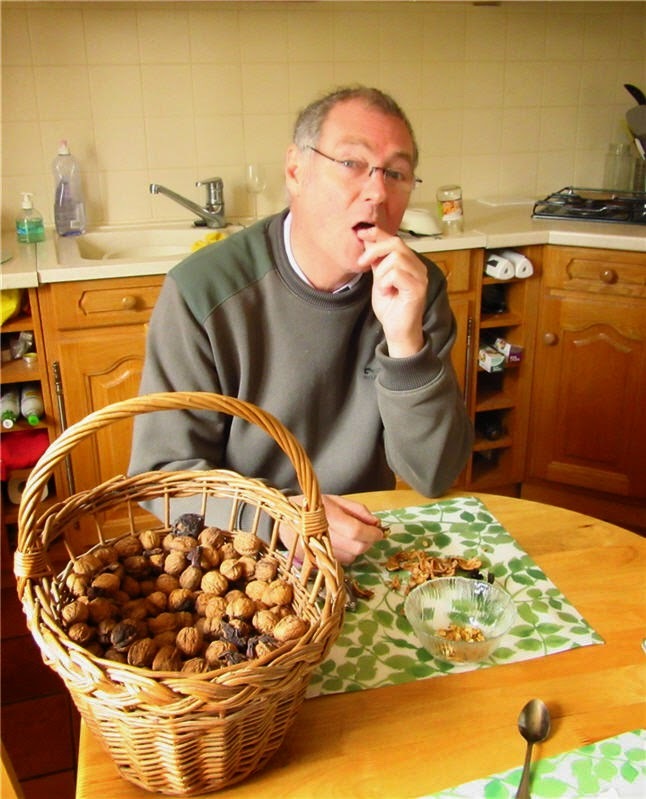 I was going to call this 'Enjoying Nick's Nuts' but thought better of it! Yes we are still using some of the walnuts Jean and Nick gave us from their tree which, sadly, had to go in the name of progress. 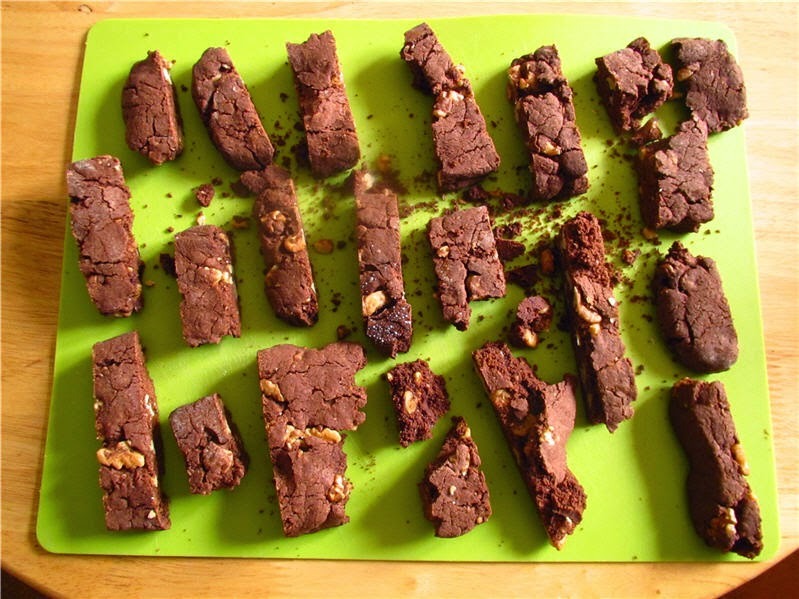 Today we made Chocolate Walnut Biscotti, but using gluten free flour. 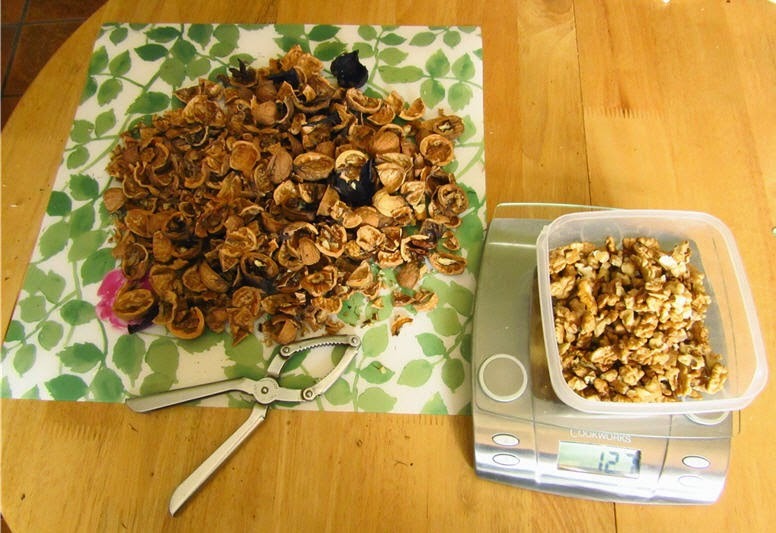 The first job was to reach the magic 100g of shelled walnuts because with Colin shelling them, that task seemed more remote by the minute..
Who would have thought it would take so many walnuts to reach 100g anyway? The recipe uses 200g of plain dark chocolate which is melted with 25g butter. Mix together 200g self raising flour, one and a half teaspoonfuls of baking powder, 100g light muscavado sugar, 50g polenta and the finely grated rind of half an orange. (We used lemon instead). Stir into this, one beaten egg, one teaspoon of vanilla extract and 100g walnut pieces. Then add the melted chocolate and butter and mix well. If the mixture seems a little dry, add one tablespoon of water. Bake these in a pre-heated oven at 160C for 25 mins or until firm. Leave to cool and then cut into 1.5cm thick biscuits and return to the oven for a further 10 minutes until crisp. When cool, serve sprinkled with icing sugar. Such is the nature of gluten free baking! Gluten exists for a purpose! Next time we will try using two eggs in an attempt to bind the mix together and avoid the above. Labels: Chocolate Walnut Biscotti, gluten free baking, walnuts. and the dissapointment you'd've caused in some circles. though, thinking about it, that could be the shelf-stackers playing rugby with the boxes?!? I'm glad our nuts are being put to good use. I always find it surprising how many you have to shell to make enough for a recipe. Especially if they don't all make it into the dish.....quality control I guess! 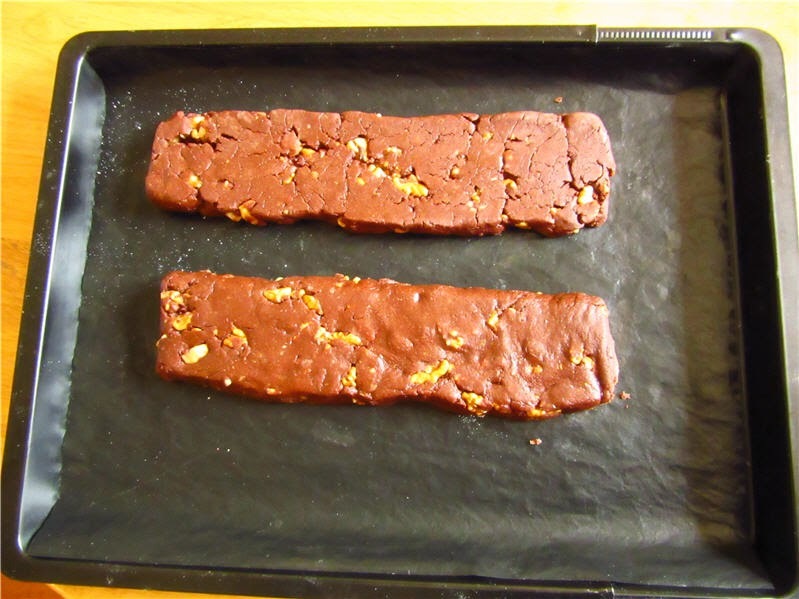 Judging by your biscotti, it was worth the time and effort - they look delicious! Yes, Tim, I'm rather glad we didn't think of that one!! 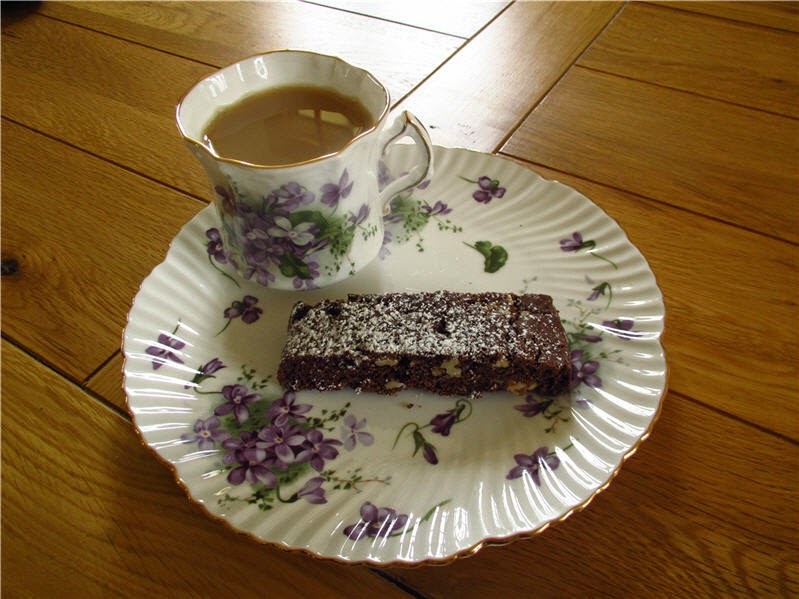 Jean and Tim, the biscotti are delicious but eating them in crumb form with a teaspoon is probably not the most socially acceptable way to serve them! !